Sale Price $0.99 per lb. Rubber Hex Dumbbells For Sale - IRON COMPANY® commercial rubber hex dumbbell sets are now available for only $0.99 per lb. while supplies last. Our rubber hex weight sets feature pinned heads, thick virgin rubber and beefy chromed ergonomic handles. Rubber hex dumbbells for weight training are one of the best free weight investments you can make when outfitting any gym. Their durability, impact resistance and competitive pricing make them ideal for garage gyms, school weight rooms, CrossFit boxes and commercial gyms. Pack on some serious muscle mass and strength gains with your new IRON COMPANY rubber hex dumbbell set available in 5-50, 5-75, 55-100, 5-100 and 105-125 lb. set options. Local pick-ups are available in Los Angeles for even more savings. Available for government and military open market purchases via GSA contract GS-07F-0104M. What separates IRON COMPANY Rubber Hexagonal Dumbbells from the rest? Safety: We utilize a unique "Safety-Head" design that permanently attaches cast iron heads to solid steel handles. This pinned head is what separates a residential rubber hex from a commercial rubber hex. Cheap, low quality rubber hex dumbbells only have the heads glued to the handles, which more times than not separates and falls apart if repeatedly dropped. Glued hex weights are suitable for home use only. Virgin Rubber: The virgin rubber used to create the impact resistant shell of the IRON COMPANY rubber hex is long lasting and will not dry out, crack and peel like inferior recycled rubber. Reduced Odor: Any product produced from rubber can have an initial rubber smell upon delivery. This slight odor soon dissipates from quality made fitness products. 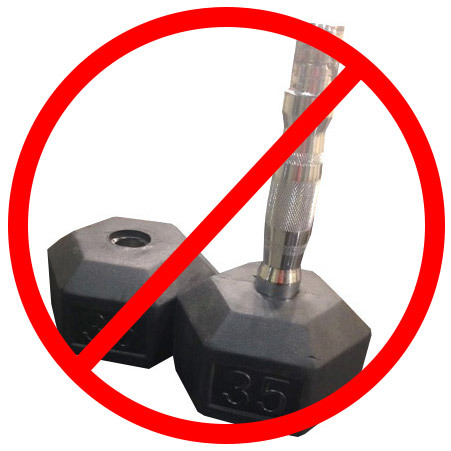 Cheap, low quality rubber hex dumbbells can be made with dirty, toxic fillers, such as used motor oil, that will quickly fill a room with noxious odors that often never goes away. IRON COMPANY rubber hex dumbbells are ideal for any location with or without proper ventilation. Pricing: At only $0.99 per lb., IRON COMPANY commercial quality rubber hex dumbbells are offered at an unbeatable price. Safety-Head Design For Maximum Strength and Durability! 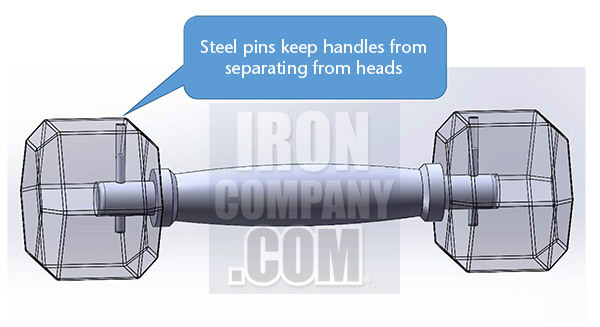 The illustration below shows our unique "Safety-Head" construction which prevents cast iron heads and steel handles from ever separating thus eliminating safety and liability issues common with many other rubber hex dumbbell brands. The broken rubber hex image below is an example of an "economy" rubber hex dumbbell that was simply glued together, a common problem for the unsuspecting consumer. Quality product at a quality price! What racks do you recommend for these dumbbells? BEST ANSWER: IRON COMPANY Rubber Hex Dumbbells work well with most dumbbell racks without rubber dumbbell saddles. A shelf rack, tray rack or other rack pictured with rubber hex dumbbells work well. An IRON COMPANY sales rep can help you determine the exact dumbbell rack for the set you need, the space you have and the budget you are working with. 2-Year Limited Warranty to the original purchaser against manufacturer defects. This does not include damage received due to misuse and/or abuse such as dropping, throwing, extended exposure to elements, etc. To extend the life of your dumbbells, always use with rubber mats sufficient enough to absorb the impact if dropped. Repeatedly dropping your dumbbells, especially heavier sizes, can damage your dumbbells over time. Store your rubber hex dumbbells in a dry location out of direct sunlight. Never use industrial strength cleaners or solvents on your dumbbells. Clean with mild soap and water if needed. Local Pick Up: Local pick available in Los Angeles with 24-hour notice. Please email quotes@ironcompany.com or contact an IRON COMPANY sales rep for details. LTL Freight – Ships via LTL freight carrier on a wooden pallet. All standard freight deliveries include 24-hour notification and curbside delivery. Additional services such as lift gate or inside delivery are available upon request. A full inspection is required at delivery and notation on delivery bill of any missing or damaged product is mandatory for replacement. NOTE FOR WILL-CALL PICKUPS: Sales tax rate of 10.25% applies for customer pickups from Los Angeles, CA warehouse. Actual sales tax for sales order may be different from what is initially calculated based on customer's address entered at point of sale and will be adjusted at the time of warehouse pickup scheduling confirmation.